"A shocking story of rebellion and revelation set in a contemporary Nazi England"
Jessika Keller is a good girl: she obeys her father, does her best to impress Herr Fisher at the Bund Deutscher Mädel meetings and is set to be a world champion ice skater. Her neighbour Clementine is not so submissive. Outspoken and radical, Clem is delectably dangerous and rebellious. And the regime has noticed. Jess cannot keep both her perfect life and her dearest friend. But which can she live without? Julie Mayhew originally trained as a journalist, then as an actress, and she started writing because she hardly ever saw a script with a brilliant role for a girl or a woman. 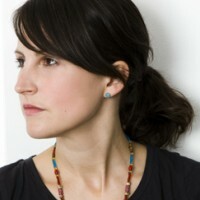 She is the author of RED INK (shortlisted for the 2014 Branford Boase Award) and the critically acclaimed THE BIG LIE. She is also prolific writer for radio, and has twice been nominated for Best Original Drama at the BBC Audio Drama Awards for her plays A SHOEBOX OF SNOW and THE ELECTRICAL VENUS. Julie is a recent recipient of an Arts Council England Award and a K Blundell Trust Award to research and develop stories in Berlin and in her hometown Peterborough, and she is currently under commission to write a free and modern adaptation of THE RAILWAY CHILDREN for Eastern Angles Theatre. She lives in Hertfordshire with her family, where she is host of short story cabaret The Berko Speakeasy.